MCPARC is pleased to announce that in 2004 we assisted with the creation of this area's first Disc Golf course. This first involved creating a course layout at Morris Park, weaving through the the gentle hills and massive trees of this quaint little park. The City of Fairmont has enthusiastically given their support for establishing the challenging and fun game, one that all ages can get involved in. The WVDGA has recently completed the 18-hole challenging woods course entitled “Orange Crush”. 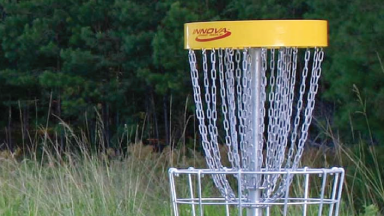 The 36-hole disc golf course complex offers multiple tee boxes and pin locations throughout. For updated tournament information and course activities check out the West Virginia Disc Golf Association. Funding for course equipment (tees, baskets, markers, etc.) is by donations and the light upkeep of the course will be performed by the Fairmont Disc Golf Club. Check out www.wvdiscgolf.org for tournament and course information. Disc golf is played much like traditional golf. Instead of a ball and clubs, however, players use a flying disc, or Frisbee®. The sport was formalized in the 1970s, and shares with "ball golf" the object of completing each hole in the fewest number of strokes (or, in the case of disc golf, fewest number of throws). A golf disc is thrown from a tee area to a target, which is the hole. The hole can be one of a number of disc golf targets; the most common is called a Pole Hole®, an elevated metal basket. As a player progresses down the fairway, he or she must make each consecutive shot from the spot where the previous throw has landed.The trees, shrubs, and terrain changes located in and around the fairways provide challenging obstacles for the golfer. Finally, the "putt" lands in the basket and the hole is completed. Disc golf shares the same joys and frustrations of traditional golf, whether its sinking a long putt or hitting a tree halfway down the fairway. There are a few differences, though. Disc golf rarely requires a greens fee, you probably won’t need to rent a cart, and you never get stuck with a bad "tee time". It is designed to be enjoyed by people of all ages, male and female, regardless of economic status. Disc golf can be played from school age to old age, making it one of the greatest lifetime fitness sports available. Specially-abled and disabled participate, giving them the opportunity to take part in a main stream activity. Because disc golf is so easy to learn, no one is excluded. Players merely match their pace to their capabilities, and proceed from there. The Professional Disc Golf Association, with over 20,000 members, is the governing body for the sport, and sanctions competitive events for men and women of every skill level from novice to professional. In 2001, there were 385 PDGA-sanctioned events across the world involving over 30,000 players and over $800,000 in professional player winnings. Today, there are over 1200 permanent disc golf courses around the world, with over 1000 of them in the United States. The annual rate of growth for disc golf courses is approximately 14%. The ongoing fitness boom finds more and more people taking up recreational activities in an effort to improve health and quality of life. Disc golf provides upper and lower body conditioning, aerobic exercise, and promotes a combination of physical and mental abilities that allow very little risk of physical injury. Concentration skills increase by mastering shots and negotiating obstacles. Players of limited fitness levels can start slowly and gradually increase their level of play as fitness improves. Scheduling is also flexible; a round takes one to two hours, and may be played alone, eliminating the difficulty of scheduling tee times. And as in traditional golf, disc golfers find themselves "hooked" and, thus, increasing the likelihood of frequent participation. Disc golf offers year-round fitness, even in rain or snow. Perhaps the greatest attribute of the sport is the expense — or rather, the lack of it. A professional quality disc costs less than $10, and it only takes one for basic play. And, of course, there’s the sheer fun of the game — no matter what your age or skill level! Play disc golf — the sport of the future! All directions, except hole #1, start at the previous hole's basket. Distances are in feet from the short tees. 148 feet - Starts at the pavilion to the left of the entrance circle. Hole #1 long is on the other side of the pavilion and cannot be seen from the short tee. 274 feet - Cross entrance circle and go over the hill near the gate. 318 feet - Cross road and tee is behind all the pine trees. 252 feet - Down the hill near the road, you are throwing back up the hill. Be careful of the empty fish pond. 263 feet - Down the hill and across the bridge, tee is near the pink well. 241 feet - Go around curve and cross road. 268 feet - Across the road. 207 feet - Near bathrooms and in the little grassy part of the road. You are throwing straight up the hill. 232 feet - Around the curve and next to the tree. 350 feet - On the road edge to the left of 10’s basket. You are throwing through the center grassy area. 515 feet - Across the road and over the hill. 292 feet - Across the road and around the bend, near a tree. 323 feet - Up the hill and under the tree. 301 feet - Up the big hill and near the good tennis court. 261 feet - To the right of 15’s basket and near the driveway. 245 feet - Around the corner from the basketball court, near the edge of the hillside. Runs the length of the old tennis court. 206 feet - Follow path down hill (straight past 17’s basket). Will bring you out near restrooms. Follow road around curve then go over hill. Tee is near a tree. All tee box flags are marked long or short. All holes except #3, #5, #12 have long tee’s placed. Holes #9 and #10 still need the paths cleared for the long tee’s. All long tee’s can be seen from short tee position except for #8. The long tee for #8 is on the other side of the pavilion near a bench. As always have fun and please be very cautious of walkers. They were there before we were. I-79; exit 135 (Pleasant Valley Rd.). Turn towards Pleasant Valley, 0.3 mile to a left at stop sign, 0.3 mile to a right into Morris Park (large blind curve). Park in entrance cul-de-sac or around park to the 2nd pavilion. 1st tee next to pavilion. Please contact us by email or phone with any questions you have regarding the disc golf course.